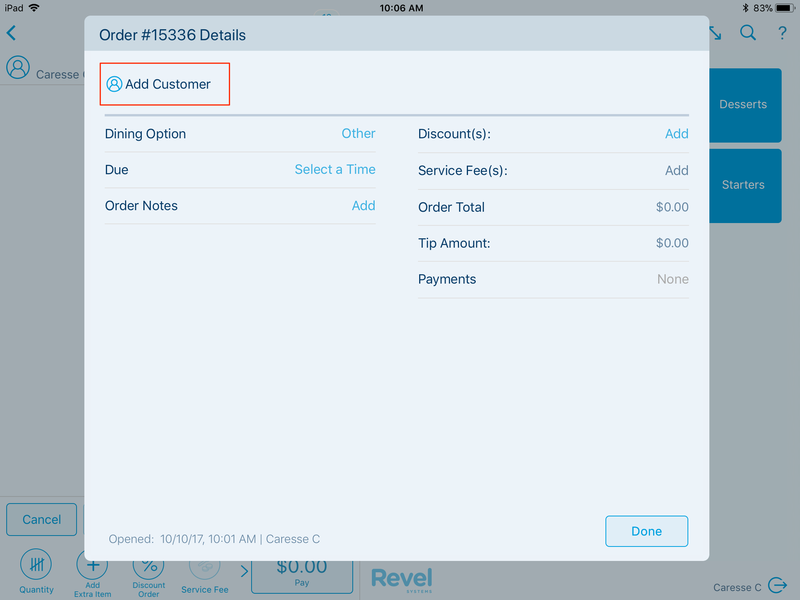 Revel Systems offers the ability to customize your loyalty and rewards programs. This feature gives you the power to create engaging programs that generate customer loyalty and increase sales. Visit: A customer receives one Visit reward point every time the customer makes a purchase at the establishment. Purchase: A customer receives points based on the total amount of the customer's purchase. Item: A customer receives points based on the products purchased. 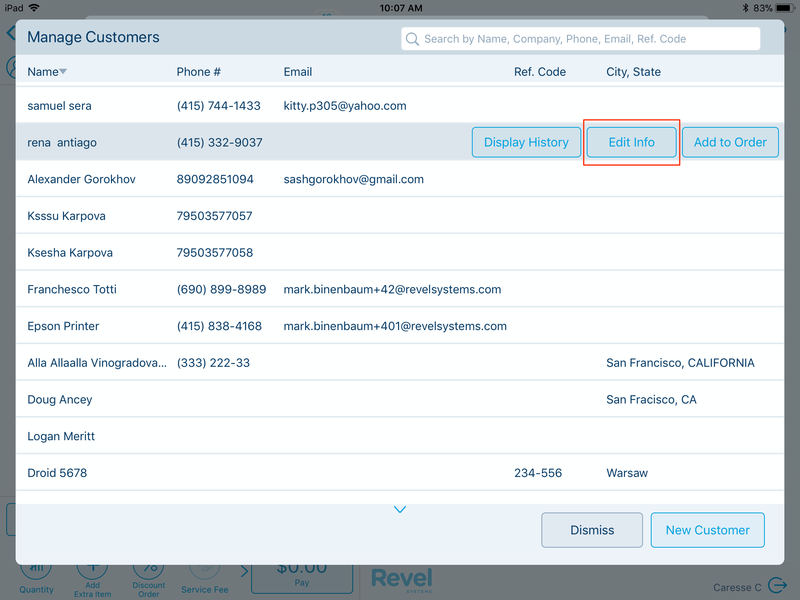 Please contact Revel Support to have your desired reward type enabled. In the Management Console ([yoursubdomain].revelup.com), click the Settings tab and then click Clear Selections. Check the box next to Gift, Rewards, and Admin Cards in the left side menu. On the right side, scroll down to the Gift, Rewards, and Admin Cards / Loyalty section. Print Masked Rewards Card Number on Receipt will print the last four digits of a customer's rewards card number on the receipt. 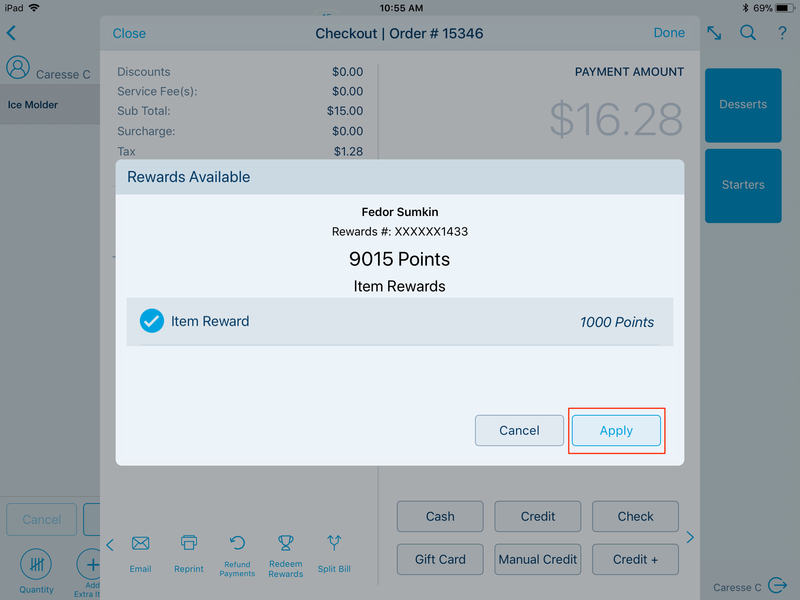 Print Reward Balance on Receipt will print the customer's current reward points. Print Points Needed to Redeem Next Reward on Receipt will print how many points the customer needs to earn before they reach the next reward discount. Minimum Purchase Needed to Accrue Points allows you to enter a minimum amount the customer must spend per transaction in order to earn reward points. 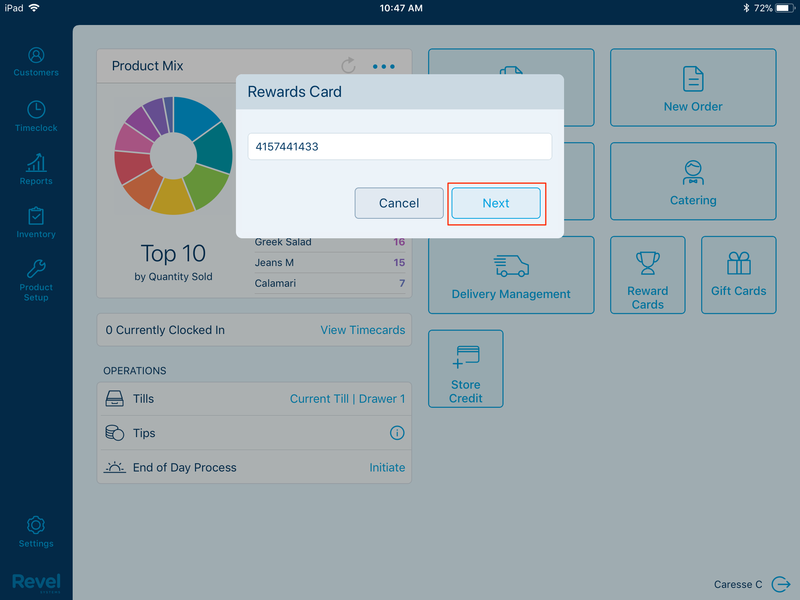 Reward Prompt Method allows you to choose how you want the POS to display the rewards prompt. By Prompt (default) will prompt once payment has been taken. By User Selection will not prompt at all, but will instead allow employee to swipe rewards card or enter rewards number at their discretion. By Prompt on Tapping Pay will enable a prompt as soon as the payment button is tapped. Allow Multiple Reward Redemptions per Order allows customer to redeem more than one reward per order if they have enough points. Show on CDS will display redemption and point values on your Customer Display Screen. Cash Back Rewards allows customers to redeem accrued points for money off their purchase. Enter the name of the reward in the Reward Label field. Each Point Earns How Many Dollars Back allows you to set how much money each point is worth. If it is set to .01, then each point is worth one cent and 100 points will equal $1 off. Programs Supported allows you to choose if you want Cash Back Rewards to be eligible for Visit, Purchase, Items, or Pooled rewards. 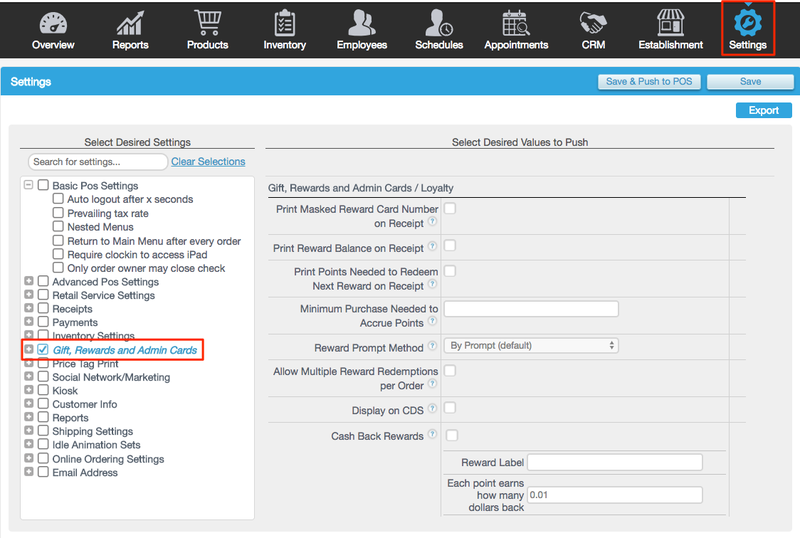 Enable Default to Manual Rewards Card Input if you do not use plastic rewards cards and only enter the rewards card number manually. 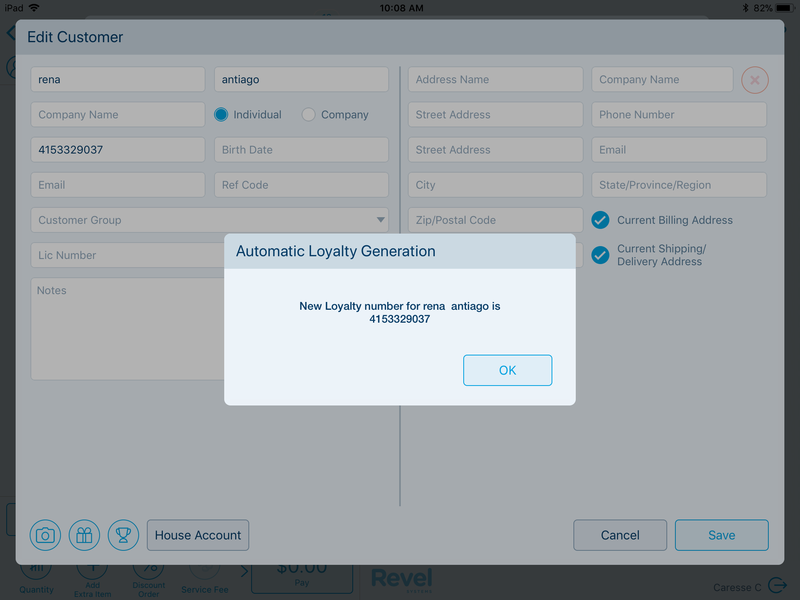 Allow Automatic Loyalty Generation will auto-generate a loyalty account for each new customer. In the Management Console, click the Settings tab and then click Clear Selections. Check the box next to Customer Info. 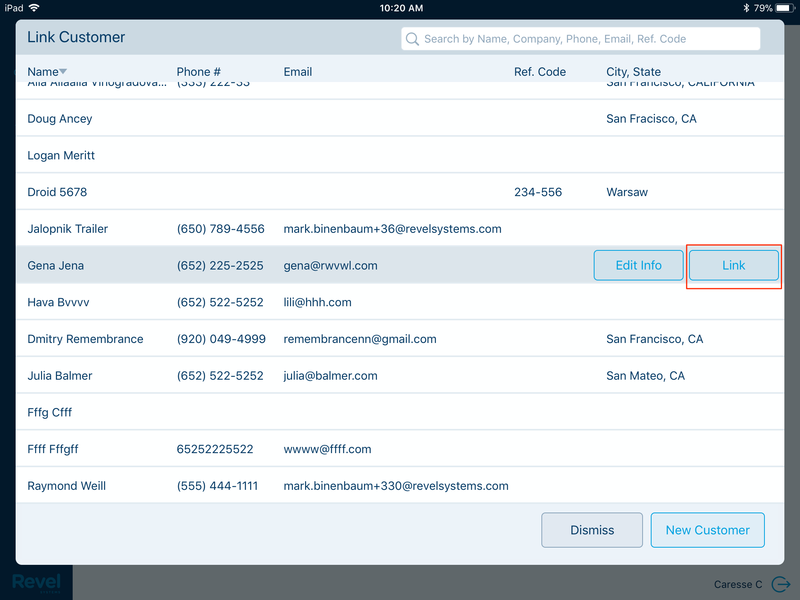 On the right side, you will see various customer info settings. Prompt for Customer will open a prompt to assign a customer to every order. On Pay will open the prompt when you tap the payment button. Require Customer makes it mandatory for a customer to be added to an order. Automate Rewards Card Usage will prompt to use a customer's linked rewards card for reward redemption. In the Management Console, click the Products tab. From the left menu, click the Discounts section. Click +Add New Discount in the top right corner. First, enter the Discount Name. 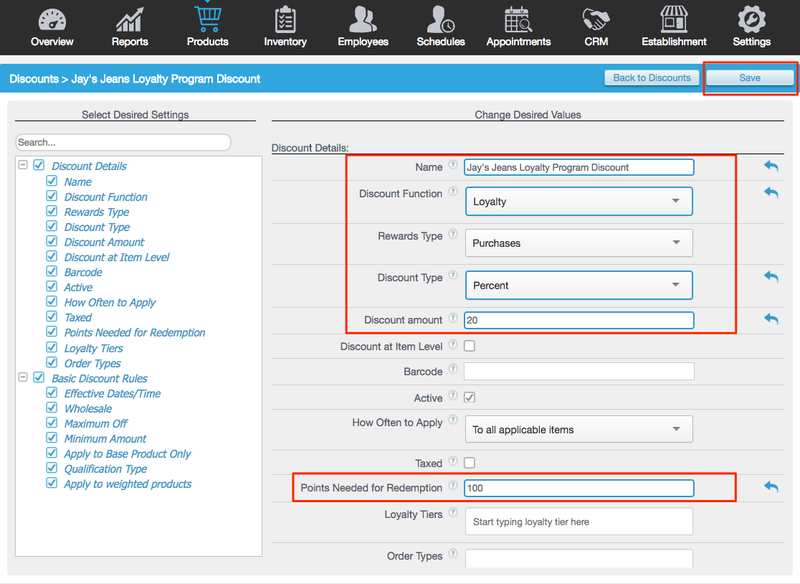 Next, click the drop-down under Function and select Loyalty. Then, from the Rewards Type drop-down, choose which loyalty program will use this discount. Alt-Price: The alternative price is used. This is configured on the item's Details page. In the Discount Amount field, enter the amount of the discount. Input the Points Needed for Redemption. To find a full list of your loyalty discounts, in the Discounts page click the drop-down in the top right corner and filter to Loyalty Discounts. 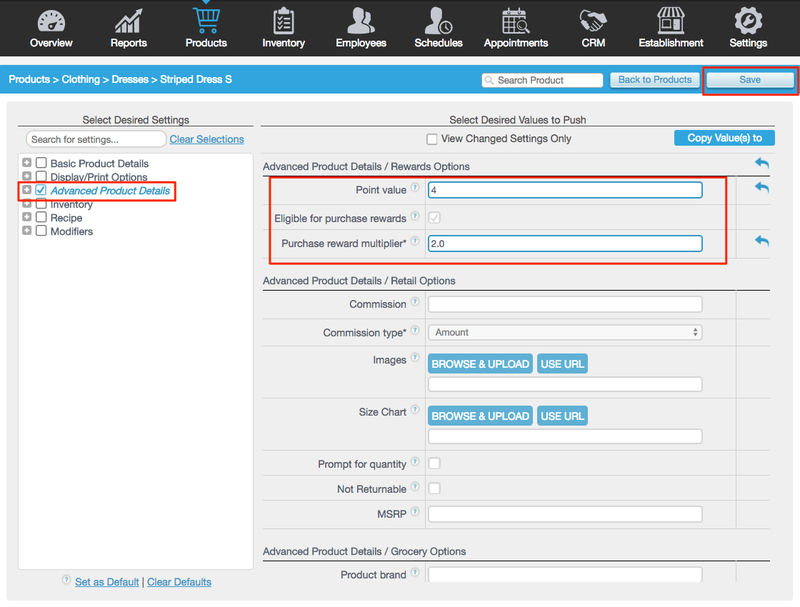 In the Management Console, click the Products tab. Locate a product you need to assign points to and click the product’s pencil icon. Check Advanced Product Details from the left side. On the right side, scroll down to the Advanced Product Details / Rewards Options section. 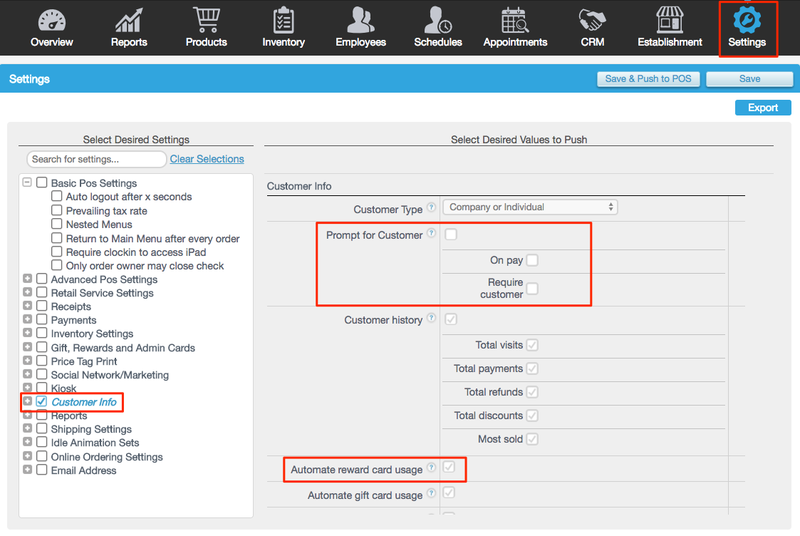 In the Point Value field, enter the amount of points a customer earns when purchasing the item. If the product is Eligible for Purchase Rewards, leave the box checked. Enter the purchase reward multiple for the product in the Purchase Reward Multiplier field. For example, if this product is worth double rewards points, enter 2 in the field. If you would like to add rewards points to multiple items at once, you can do so using an advanced product export. In the Products page, click Import / Export in the bottom right corner and choose Products from the drop-down. On the next page, for the Export Type, choose Advanced. Click the Export Contents box and select Rewards. Export your file, fill out the rewards points accordingly, and import the file in the Import Products section. 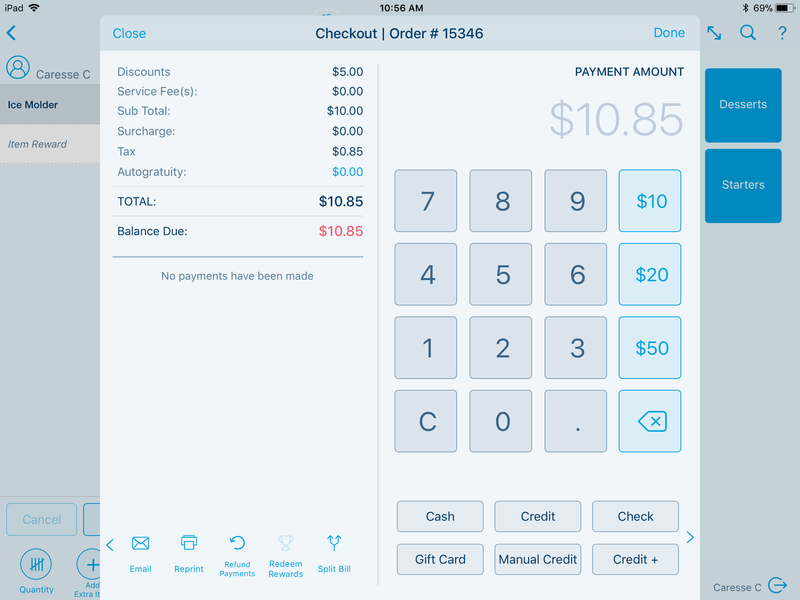 If you are on the order screen, tap on the order number, then select Add a Customer. Select a customer. Then tap Edit Info. On the bottom left corner, select the Trophy Icon. 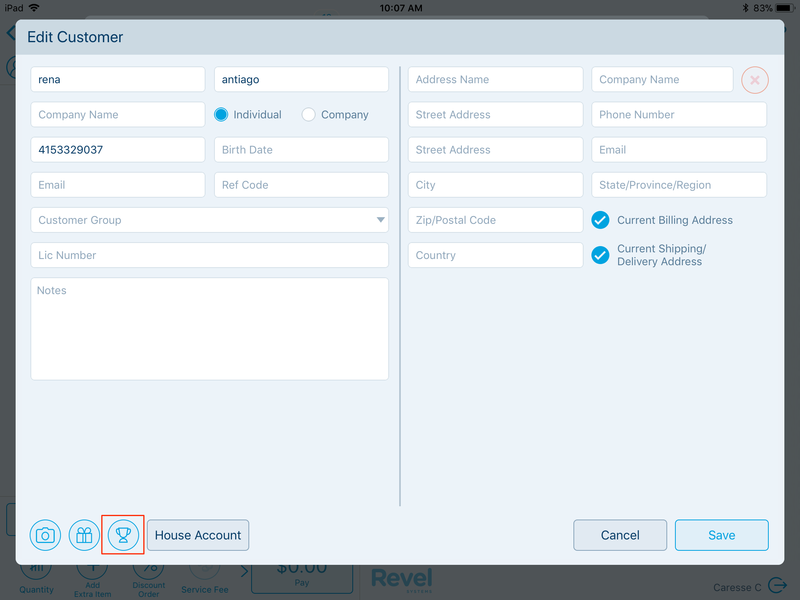 Link an existing rewards number or tap Generate to have Revel generate one for you. If you are using plastic rewards cards, swipe a new rewards card on your credit card swipe. An updated Rewards Card Info window will appear. The second way to add a rewards number is on the dashboard screen. Tap Reward Cards. Then swipe or the number the number of your rewards card. If the card number does not exist, tap Create. Select the desired customer, then tap Link. On the dashboard screen, tap Reward Cards. If you are using plastic rewards cards, swipe the card on your credit card swipe. If you don’t use actual physical cards to track rewards, enter the rewards card number and tap Next. The Rewards Card Info window will display all card details: Customer, Item Reward Points, and Total Purchase Rewards. In this window, tap edit to Add Item Points, view Customer Info, or add the card and customer To Order. 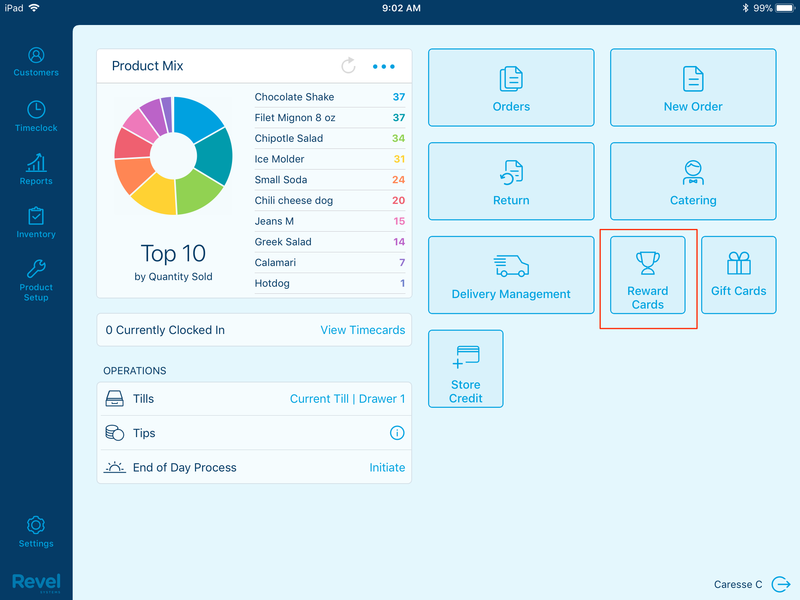 On the POS, create a new order and add products as usual. 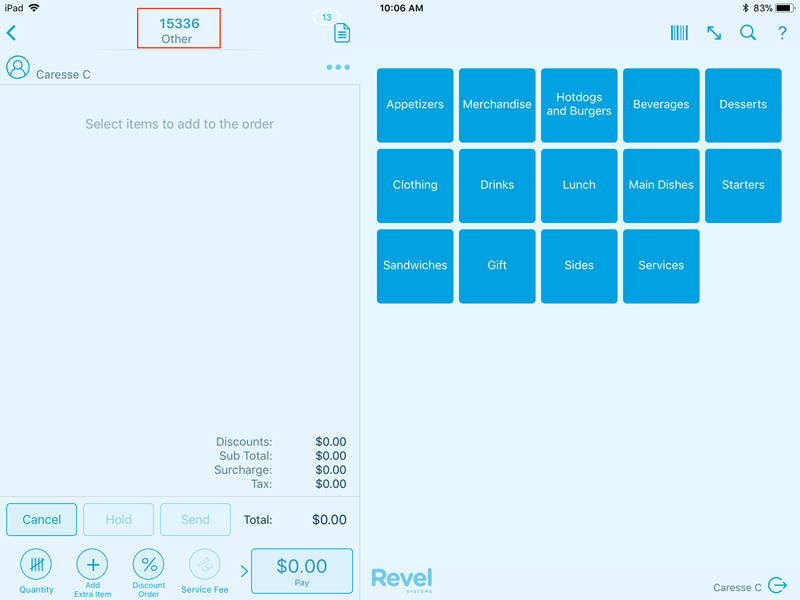 Tap the Customers button, locate and tap a customer, then tap Add to Order. Next, tap the Pay button. 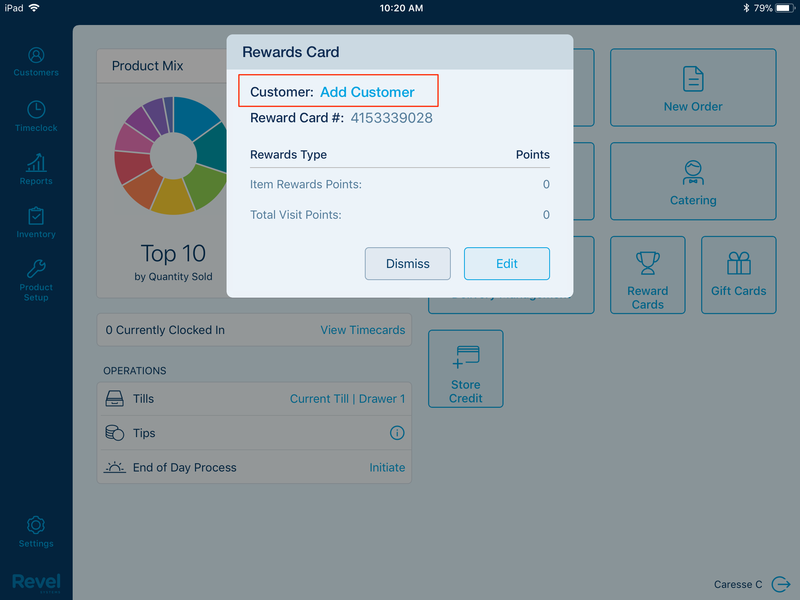 If the customer has earned enough points for a reward, a Redeem Points window will appear stating Customer has earned enough points for a reward. Once payment has been received, a Reward Points Balance window will appear showing the customer's total rewards balance. Tap Close from the window. Tap Done to close the order.